Jmm documents exported from JM-Mobile editor can be put in any Web server to distribute, then any java-enable cell-phone installed our JMM Browser can download and playback the Jmm documents from the web server. JM-Mobile Bluetooth Server provides the easy and wireless ways to distribute the multimedia content and the multimedia interactive content/application to the consumers who are approximate to a location. JM-Mobile document on demand server. JM-Mobile Bluetooth Server in trying DEMO mode is available to download . The DEMO mode doesn't allows to modify the broadcasting and the distributing data of the server. 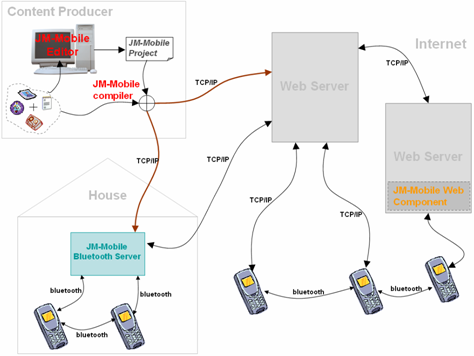 JM-Mobile Bluetooth Server user's guide is available to download .